The Geranium Farm is the magical place where author Barbara Crafton lives, writes, watches birds, and obsessively tends her garden. It's a place brimming with life and life's lessons which find their way into daily emails from Mother Crafton to thousands of readers. Each of these emails takes a slice of everyday life, pares it of all humdrumness, then splices its rejuvenated everydayness into holiness. You'll find yourself experienceing the extraordinary ordinary ... everything in God and God in everything. - Publisher Crafton's popular "almost daily" and "almost reverent" email meditations have become a lifeline to an increasing number os listserv readers around the world. Her second volume of emails continues, even expands upon, the wide range of tone and subject matter of the first. In their daily variety and richness, these emails emulate the lives we all try--and sometimes fail--to lead in life. 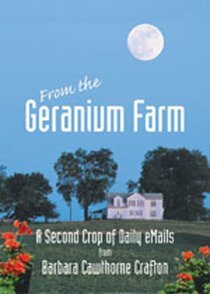 About "From the Geranium Farm"
Crafton's popular "almost daily" and "almost reverent" email meditations have become a lifeline to an increasing number os listserv readers around the world. Her second volume of emails continues, even expands upon, the wide range of tone and subject matter of the first. In their daily variety and richness, these emails emulate the lives we all try--and sometimes fail--to lead in life. Barbara Cawthorne Crafton is an Episcopal priest, spiritual director, and author. She is the founder and head of the Geranium Farm, www.geraniumfarm.org, an online institute for the promotion of spiritual growth, which publishes The Almost-Daily eMo from the Geranium Farm, read by thousands of people worldwide. Her articles and reviews have appeared in the New York Times, Reader's Digest, Episcopal Life, and other publications. She is the author of many books, including Let Every Heart Prepare; Some Things You Just Have to Live With; Jesus Wept: When Faith and Depression Meet and The Sewing Room. She lives in New Jersey.